I usually sit front row at Fashion Week, mingle with the crème de la crème of the entertainment industry at A-list events and I found myself at Miss Gay Jozi held at the Wits Theatre, Johannesburg on the 17th of May 2014 seated at a very noisy block which was like 7 rows away from where I’d usually sit. Not to mention I had to buy a ticket to come watch drag queens lip sync for their life, mind you I’m used to getting an exclusive invite to watch Who’s Who sing live. Not that I’m complaining, just putting it out there. It’s been a while since I attended such a great pageant hosted by the LGBTI community. 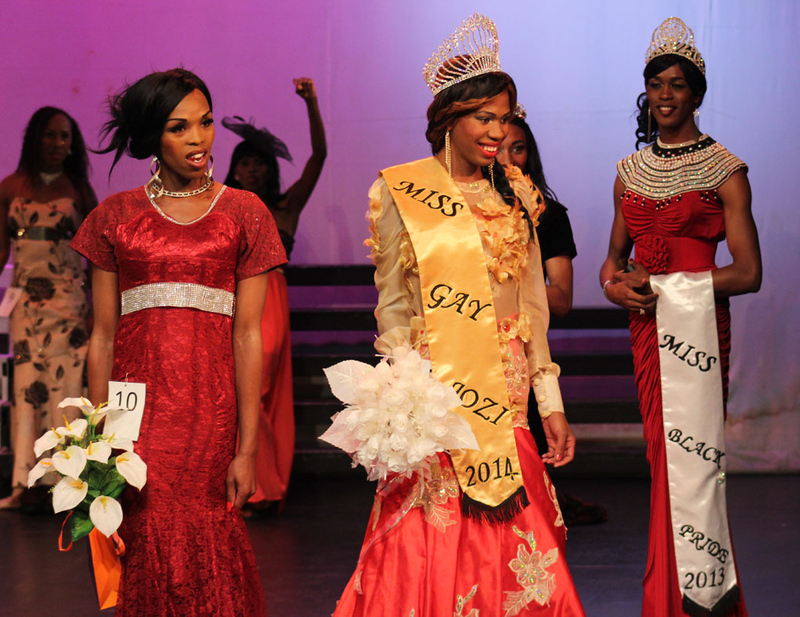 At Miss Gay Jozi I felt like I was watching Miss World Pageant. From the outfits the one MC wore Zsa-Zsa the girls and the performances. For the first time I was convinced that they did research to understand what we people want. The introduction of the Club Simply Blue reigning queens was the BEST! The traditional wear introduction the girls killed it! Out of 12 girls only 1 girl didn’t get it right, Thibi and if RuPaul was present she would have said “Sashe Away” and that will mean end of her journey in the competition. The swim suit, such perfection! For a second I imagined Miss Universe swim suit competition that’s how good it was. Like the usual, there will always be bad girls and this time around it was contestant number 2 and 4 who wore lingerie. Such disappointment! Listening is a skill girls, and you clearly don’t have it. The cocktail wear all the girls were such stunners! Miss Tee and Somizy wore it best! I could see myself in Somizi’s white dress at this year’s Style Awards. 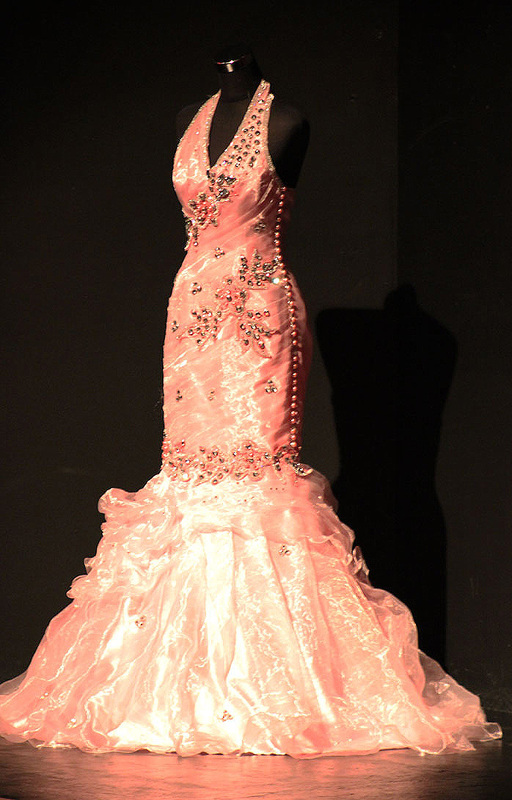 And then there was evening wear, Ball Gowns… Well clearly contestant number 1, Sjarmante Diamante didn’t get the memo or she probably didn’t want to listen as she got it wrong! She was is in a wedding gown, more like she is about to walk down the aisle. My favourite was Somizy, Miss Tee and definitely Davy who looked like she was at the Miss Universe pageant. She looked amazing in a blue dress with open sleeves. She reminded me of Lwandle Ngwenya, Miss SA 12 finalist. There was a point where I wished they could ask the audience if we still want more performances. Besides the fact that they were all AMAZING but truth is less is more. I felt like I was in a concert rather than a pageant. The opening performance by Divas of Drag was “OK”. Ella has grown, she’s more of a performer now than an entertainer. She sings! Perfect for the theatre. Labelz D’Glamour, actually no! LABELZ D’GLAMOUR. Nhlanhla Ncinza of Mafikizolo would be so shy if she were to see this girl’s performance. She nailed it! If she was in attendance she would probably hide somewhere, when a drag queen gets a standing ovation for performing your song better, joh! Tina Turner’s performance was Simply The Best just like the tittle of the song she performed! I won’t be surprised if some people were convinced it was her performing. There were too many performances in a way that if I were to bore you with the details it will be two pages. Wits Theatre is such a dignified space, more like you are on Broadway, there is no way you would imagine that people can let loose just like that. On arrival with Maureen Majola and Smanga Shange, just after paying for our tickets I asked one of the organizers if it was possible to interview the girls. “Not in this competition my dear, how can you arrive at 8pm and want to interview the girls, the media people did that at 6pm” that’s the response I received from one of the organizers. Despite me humbling myself saying “its owk I understand” he still made it a point to go on and on forever. I was so B.O.R.E.D I needed a drink to loosen up again. Just like at any other pageant in the world, when close friends and family are proud of their girl they would go up on stage and hug the winner, take pictures with her, like Donald Trump at Miss Universe pageant would say. I will keep the memories and he does that through pictures. 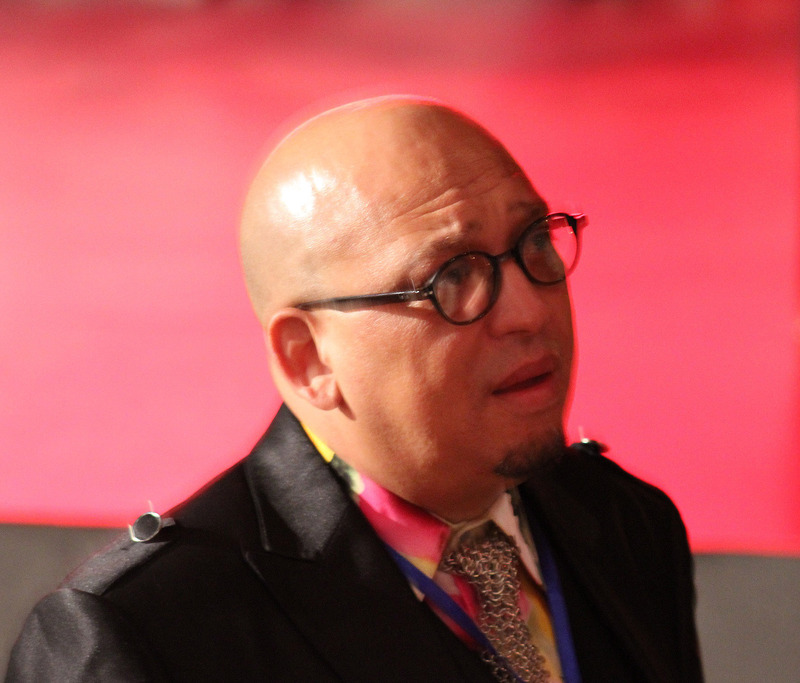 At Miss Gay Jozi it was a different story, when Lesiba Mothibe, Miss Tee’s mother and I were on stage to congratulate Miss Tee and take pictures, pageant organizer Dino Abrahams came on stage and screamed like someone who is watching scary movie One Missed Call. I couldn’t believe it! “Get out of my stage, you don’t belong here” He said. While I was still digesting that, Dimpho all the way from Vaal with her friend Leroy were in such bad behaviour, in a way that Leroy was so drunk that she could not contain herself and found herself a comfortable corner inside the theatre to get some sleep, I don’t know if she passed out or she decided to take a break from the 5 litre boxed wine they were busy with and puffing smokes like they in a tavern, so embarrassing! Labelz D’Glamour belongs in Rio! She was the BEST, basically the highlight for the evening. Her performances, I mean, I’ve seen the best girls on stage perform in Cape Town, CREW amongst other venues and at Miss Gay Western Cape but I can say they have nothing on her. More like how Beyonce did it at her “I AM” World Tour. Her Waka Waka performance was the best, from her grand entrance, the outfit and the whole performance, even RuPaul would give her a standing ovation had she been there. The Mafikizolo performance. It will take time for me to think of Nhlanhla Ncinza when I hear Khona by Mafikizolo. She owned it. Fake eyelashes are allowed, most contestants and performers wore them. Padding to add curves, I don’t get it but fine. Fake flowers for the winner! A NO, NO! I don’t know what the idea behind it was and where did they get it. Maybe they want the winner to hand them over to the next year’s queen when her reign finishes? I have never! I mean if the Acting Editor of True Love who was previously Editor of Real Magazine before it was canned was present, she would have been so embarrassed that there are beauty queens who want to be cover girls with no stories to tell. Second princess was just lucky to place on the Top 3 as she also couldn’t answer the question. She explained something about the bible for about 5 minute and only made one valid point which was also not really answering the question. 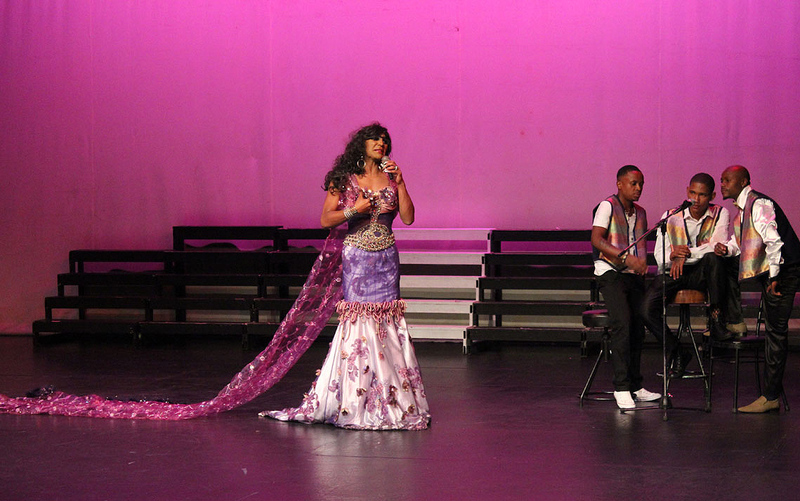 Despite contestant number 4, Cheaza Jaars failing to answer the judges question she still took the Second Princess spot. I would say she deserved it since there was no one else would have been the contestant to take that position as most girls were the weakest links when coming to answering what was asked. The first princess position went to contestant who I didn’t expect to be on the top 3, Thibi Monale. She failed dismally to answer the judge’s question and yet she wishes to be True Love Magazine cover girl with no story to tell. Miss Tee Menu, Shaka Zulu’s daughter as she introduced herself in her traditional outfit. It was clear that to me that she was the obvious winner with her well presentation of traditional, swim suit, cocktail, Ball Gown and nailed the final question. “For the first time a deserving girl wins” – Jason Samuel said after Miss Tee Menu from Daveyton was crowned Miss Gay Jozi 2014. This entry was posted in As we are, Dancing, Description, Friendships, Human Beings, Human rights, Inkanyiso crew, Inkanyiso media, Interpretation, Intervention, Know Your SA Queer History, Knowledge, Living by example, Love, magazine, MissTee Menu, Our lives in the picture, Participants, Penetrating mainstream spaces, Photo Expressions, Photography, Power of the Arts, Power of the Voice, Presentations, Privilege, Queer Edutainment, Queer Power, Queer visibility, Questioning, Questions & Answers, Real, Recognition, Records and histories, Self-worth, Sharing knowledge, Smanga Shange, Women; Voices; Writings; Education; Traditions; Struggles; Cultures, Writing is a Right, Young talent, Youth voices and tagged artists, Arts, beauty, Club Simply Blue, Drag Queens, Dressing up, Entertainment, Fashion Week, Glamour, Homosexuality, Homosexuals, Jozi, Laughter, Life, lip sync, Miss Gay Jozi 2014, performance, True Love, Wits Theatre, Yaya Mavundla. Bookmark the permalink. Damn. Ngyakuthanda Yaya vha!uyabhala ntombazzana Jd!yabona when I say journalism on its best mina nghamba nawe nje!owakho ke lomsebenzi nje! !